Italy's small, independent, radical daily is an indispensable voice on the left. American newspapers and monthlies and weeklies are in serious financial difficulty, so why pay attention to the survival struggles of an Italian daily, Il Manifesto, which has an average circulation of 30,000 and an eccentric devotion to ideas of major social transformation? It calls itself Communist in a world in which revolution counts as another twentieth-century illusion. The paper’s name derives from a 1969 declaration by a group of Communists calling on their party to awake from its bureaucratic slumbers. The party was by then a pillar of the existing order, partners with the reigning Christian Democrats in running the country. It governed major cities and regions, had great influence in the trade unions and was a major presence in the culture. The Communists’ popular and reflective leader, Enrico Berlinguer, defended settling for a limited share of power as an interim solution preferable to total opposition. To his impatient younger critics and vexed older ones, the party’s grand bargain ignored the aspirations of the citizenry and blocked the possibilities of transformation. The Manifesto group sought a renewal of party doctrine and practice, a great leap forward in popular participation. The group’s campaign was a critical element in the massive eruption of social protests in Italy in 1969, which took the Communist leadership by surprise. The dissidents left the party. The ensuing shock induced Berlinguer to rejuvenate and redefine the party–in some part in the Manifesto group’s direction. In April 1971 the group founded a daily, Il Manifesto; its first principle was independence of any party line. The equivalent in the United States would be a daily edition of The Nation (or the old New York left daily, PM, which lasted from 1940-48). 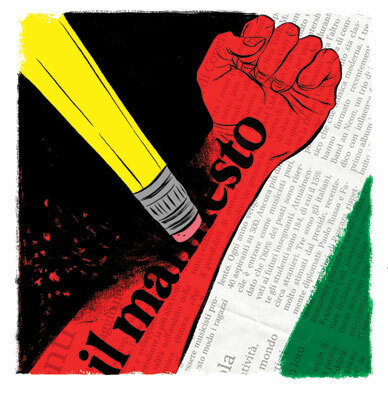 Il Manifesto became a school for independent younger journalists and a home to irreconcilably critical older ones. Its main competitor was initially l’Unità, the official daily of the Communist Party until the party dissolved in 1991. L’Unità is still published, and it is associated with the Communist successor, the Democratic Party. Its circulation has diminished from 240,000 to 40,000. Il Manifesto also confronts the much less widely read Liberazione, published by the small, stubbornly leftist Communist Refoundation Party, founded in 1991 and no longer in Parliament. Indeed, none of the smaller political groups close to the Manifesto heritage are any longer in Parliament. Many who vote for the Democrats still think of Il Manifesto as the voice of their sometimes suppressed political conscience. Il Manifesto‘s independence of party affiliation has enabled it to draw upon a broad spectrum of Italy’s radical democratic traditions. It has expressed the concerns of many social movements: associations to aid immigrants and the impoverished, neighborhood groups, seniors, students and teachers, the unemployed, women. It has exposed corruption no matter what the affiliations of the guilty. And it has made news itself. In 2000 a neofascist loner blew up a bomb (and nearly himself) at its offices. In 2005 the car in which the paper’s Iraq correspondent, Giuliana Sgrena, was speeding to the Baghdad airport was fired on by US soldiers, wounding her, killing her bodyguard and provoking an international incident. Above all, Il Manifesto has assumed the traditional radical pedagogic task of depicting events inside and outside Italy as parts of a larger whole. Much of the rest of the media, even when not sunk in bottomless vulgarity, present the world as a jumble of unconnected happenings. When the parties of the left and democratic center constituted national governments in past decades (most recently until 2008), their conflicts and hesitations prevented them from instituting convincing and durable reforms. Prime Minister Silvio Berlusconi and his allies exploited the disappointment of the citizens with a cynical antipolitics, while they looted the economy and the state, encouraged xenophobia and practiced authoritarianism. Berlusconi’s vast media holdings are united with the subjugated state television chains in a perpetual Roman carnival of lying stupidity. (Imagine Murdoch as president, Limbaugh and Coulter inescapable on television, and the Washington Post, for all its many present flaws, reduced to the level of the New York Post.) Italy’s quality papers (Corriere della Sera, La Repubblica, La Stampa) are struggling, not always with complete success, to maintain quality–while their educated readers are often restive. Now the small critical space occupied by Il Manifesto is threatened with erasure. Late last year, Berlusconi introduced legislation eliminating state subsidies for nonprofit associations. Il Manifesto is legally an editorial cooperative, not a commercial enterprise, and was eligible for state funding. But under the new law, journalistic funding is limited to media directly owned by a party. That is a status Il Manifesto‘s editors and writers do not want. They understand themselves as connected to a social movement with deep roots in the past, and they regard the tactical discipline of a party as a hindrance or worse. In any case, Italy’s parties of the left are foundering. The Democrats have just lost an important regional election in Sardinia and replaced their leader. Il Manifesto‘s independence is an element of continuity Italy’s democratic left can ill afford to lose. Should the newspaper have to cease publication, the European and Italian left would be without one of its most authentic voices. Friends influential in the Catholic Church and the senior ranks of the Democratic Party have said that they find Il Manifesto indispensable to their work. Many in the cultural and political elite agree. I did ask the editors of Il Manifesto why, in a nation with a great socialist tradition, they could not increase their newspaper’s circulation. They replied that the tradition is in disrepair; older adherents and younger potential recruits are discouraged. Moreover, they said, potential readers are distracted by the newer Internet media, which appropriate Il Manifesto‘s critical journalism, bit by bit, but which ignore its larger project of political education. The crisis of Il Manifesto offers a lesson not limited to Europe. A newspaper that deals with the vertiginous fluctuations of daily politics by asking what these mean in a larger historical context does place demands on its readers. We are left to question the viability of the old-fashioned ideas of an educated citizenry. Berlusconi has targeted, with his plebeian antagonism to the intelligence required of a functioning democracy, one of the remaining institutions of Italian republicanism. Il Manifesto‘s Italian and European supporters are rallying to its assistance. Letters (and checks) in support can be sent to the editors at: Il Manifesto, Via A. Bargoni 8, 00153 Rome, Italy. If you go to ilmanifesto.it, you can click on “donate on line” (look for the American flag).